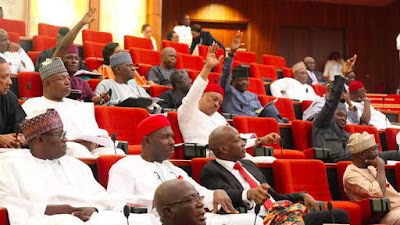 The National Assembly had just passed the bill to increase Fuel pump price from the former N145 to N150. The price increment came as a surprise to Nigerians, especially in this time of recession, after the All Progressive Alliance (APC) party promised to reduce the old pump price of N89 to 45, during their campaign (before her emergence 2015) The recent hike in price of petrol has not being "taking in good faith" accepted by majority of Nigerians. Some of the notable Senators who proposed and endorsed the bill to increase fuel are as follow; Ben Bruce, Gilbert Nnaji, Abubakar Kyari, Ibrahim Danbaba, Mustapha Bukar, Sani Mustapha, Buruji Kashamu, Senators Gaya, Clifford Ordia, Barnabas Gemade, Mao Ohuabunwa and Bukar Abba Ibrahim.